In terms of the particle itself, I think Quick-Fix may have the strongest healing beam out of all the other mediguns, with the default Medigun or the Vaccinator having the weakest. Each of the other mediguns builds uber faster than the default Medigun which probably makes them all have much denser particles in them. Inversely the Vaccinator might have a very weak particle beam too being that it overheals incredibly slowly, meaning its particles might require more build-up time in order to accumulate to full overheal. The Quick-Fix on the other hand has particles that heal incredibly quickly, don’t slow down healing when teammates are recently injured, and build uber the fastest. This means the particles in the heal beam move incredibly quickly and absorb damage instantly while also being very dense. 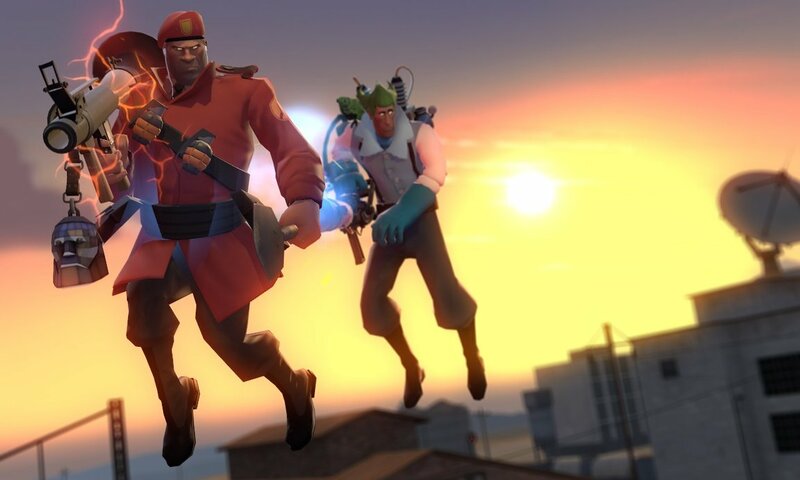 Arguably the beam could be so strong that it explains why the medic can move so fast and mirror jump with it; the heal beam is so strong that it can pull the medic along with the patient. Also, the immunity to knockback on the Quick-Fix might explain why the patients don’t get dragged down to medic’s speed when they’re being healed by it. Perhaps when the medic was first creating the medigun (Quick-Fix being the prototype medigun), he focused exclusively on the healing factor and used an excessive amount of material to make it. But since he didn’t have any real game-plan for ubers because none of the mercs had radioactive hearts at the time, the uber mechanic wasn’t actually built into it. So by the time he came out with the default medigun, he’d already used a lot of material for the quick-fix and ended up with a weaker healing beam that just had a more consistent and reliable UberCharge. None of this has anything to do with gameplay btw. While the heal beam for the default medigun is very weak, it’s still a more powerful beam. Based on the uber build on the other mediguns, it’s likely that the Kritzkrieg had a weaker healing rate than the medigun initially. The medic solved this by adding a mechanism to the gun itself (the extra bulge which is attached) which recycled the heal beam particles until they matched that of the Medigun’s heal rate. This of course would make the heal beam much thicker and explain why the uber builds faster; because it still builds uber at the same rate, but has more particles attributing to the build rate. The Vaccinator might’ve had the absolute lowest heal rate out of all the other mediguns. The heal rate was probably the same as the speed it overheals. However, rather than use a recycling chamber, Medic just added another reservoir of healing particles right under the gun itself (the extra tub). This extra reservoir increased the rate of healing wounds but didn’t contribute to overheal in that it was only designed to heal battle wounds (much like the old Quick-Fix). So the heal rate was matched with the medigun, but the overheal rate suffered. Of course, because of this extra container of healing particles, uber rate was built incredibly fast because of the multiple tanks. The multiple tanks also helped conserve uber so the medic is able to use a certain amount of uber at a time. This of course means that the Quick-Fix’s overabundance of particles is the main reason why it builds uber so fast. You can tell by the large number of dials built on the gun that Medic put a lot of stuff into this medigun that he had to keep track of. Sounds like a lot of science. Let’s fix two weapons at once! The Pistol and the SMG: Unappreciated Pea-shooters?